Ireland's economy could suffer a 4% hit if the UK and the EU fail to reach a deal following Brexit, the International Monetary Fund has said. The IMF said that because of the highly integrated nature of the Irish and UK economies, Ireland could face economic consequences as sharp as the UK's. Across the whole of the EU, the consequences of a "no deal" could be up to 1.5% of economic growth, it says. Its report looks at possible fall-out from a "cliff-edge" break with the EU. The IMF also says the Netherlands, Denmark and Belgium would face harsher negative economic effects compared with countries such as Finland and Italy, which are less close economically to the UK. The Fund's report said a "soft Brexit" scenario - with the UK out of the customs union but retaining access to the single market and agreeing to abide by EU rules - "would imply almost zero cost for the EU as a whole". A "standard" free trade deal of the type agreed between Canada and the EU could cause a hit of around 0.8%. The warning is the latest in a number of reports that suggest a "no deal", where Britain and the EU trade on World Trade Organization terms which include import tariffs, would carry significant economic costs. The IMF's 4% figure is substantially lower than claims by Dr Liam Fox, the international trade secretary, who said yesterday that Ireland's economy could suffer by up to 8% if the EU did not agree a deal with Britain. "The ball is now in their [the EU's] court," Dr Fox said. Both Britain and the EU have said that they want a comprehensive free-trade deal and a close relationship after the UK leaves the EU in March next year. But political arguments in the UK on the detail of the "deal" Theresa May wants to offer Brussels has meant preparations for a "no deal" are still continuing. 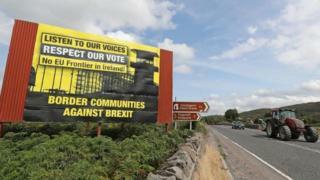 Today the EU published a paper on what businesses should do to prepare for a "no deal" situation , with some commentators believing the chances of that have increased because of the large distance still between the negotiating sides, particularly over the issue of how to retain no customs checks on the border between Northern Ireland and the Republic. "The integration of the EU27 countries and the United Kingdom has strengthened over time, reflecting shared gains from the EU's single market," the IMF said. "Conversely the departure of the UK from the EU will inevitably represent a loss for both sides." The IMF says that disruption to complicated supply chains, the increase in import tariffs and what are called "non-tariff barriers" - for example, different regulatory standards - would have a negative impact on economies across Europe. "The UK is among the top three main trading partners of the euro area," the IMF said. "Cross-border capital flows between the UK and the euro area are large [and] migration flows are considerable. "Higher barriers to trade, capital flows and people movements following Brexit could disrupt these links, reducing trade, investment and labour mobility."